Ali vs. Frazier. Batman vs. the Joker. 2Pac vs. Biggie. Pepsi vs. Coke. Some rivalries endure. Perhaps the competitors trading figurative or literal blows are so evenly matched that every contest could go either way, or perhaps the duels encapsulate a long-running controversy. The 10 rivalries on our list have that certain something that keeps them relevant long after the combatants hung up their posing trunks. We've limited our battles to the past five decades because the creation of the Mr. Olympia in 1965 greatly multiplied the repeat clashes between the world's best physiques. So, as we approach the 48th Mr. Olympia with the promise of another war between Phil Heath and his chief foes Jay Cutler and Kai Greene, we count down the 10 biggest bodybuilding rivalries of the Olympia era. Check the scoreboard and this doesn't look like much of a competition. In fact, Rich Gaspari versus Lee Haney was the second of three great short-man versus tall-man duels, and all were statistically lopsided. The other two were Franco Columbu (0 wins) versus Arnold Schwarzenegger (8 wins) and Shawn Ray (0 wins) versus Dorian Yates (7 wins). Collectively, the three bigger men beat the three smaller men 22 out of 22 times, and they racked up 21 Mr. Olympia titles versus two (both by Columbu) for their shorter and lighter foes. Size matters. Gaspari/Haney is in our top 10 because of four consecutive years of youthful battles between the former training partners. At the 1985 Mr. Olympia, rookie Rich Gaspari was only 22, and reigning Mr. O Lee Haney was only 25. That year, Gaspari was third, and the following three years he was runner-up while Haney added to his growing Sandow collection. It was never evident the younger man would overtake Haney's superior size and structure, but it was exciting to see him try. Taking his dieting and training to an extreme, Gaspari virtually invented striated glutes. Haney won a record eight Olympias and Gaspari won nine pro shows, partly because each pushed the other to maximize his potential. In the early '80s when there was an explosion of pro Grand Prix contests, four men vied for most of the titles: Boyer Coe, Albert Beckles, Casey Viator, and Chris Dickerson. On any given Saturday, you never knew how their placings would be shuffled. Within this quartet, the greatest rivalry was Viator vs. Dickerson. 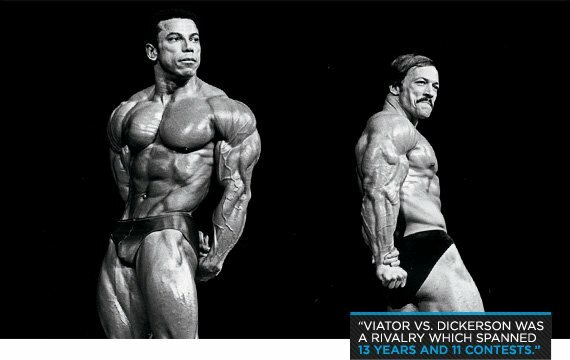 It spanned 13 years and 11 contests, starting with the 1970 Mr. America, which 31-year-old Dickerson won while 18-year-old Viator was a stunning third. The following year, Viator, at 19, became Mr. America. When Viator finally made his pro debut in 1979, Dickerson was again in first place. The following year, they faced each other seven times, including four contests in which they finished one-two (Viator won three). Their physiques couldn't have been more different. At the 1982 Olympia, Dickerson was 189 at 5'6" and won with refinements and details. Viator was a then-staggering 240 at 5'10" and was third because of the sheer overwhelming force of his thickness. The years of 1980-'82, when pro bodybuilding took shape, were highlighted by the polished 1982 Mr. O winner and the mercurial mass monster who stood in stark contrast to him. For years, whatever rivalry there was between friends Phil Heath and Jay Cutler was played out in gyms, not on stages, and even that was more of a student/mentor relationship. We were there the first time they trained together and Heath got buried by Cutler ("Phenom Backlash," FLEX, November 2006). Having turned pro eight years earlier than Heath, former phenom Cutler simply had too large of a lead then, and yet he felt Heath could one day catch him. He was right. In his Olympia debut in 2008, Heath came in third, one place behind Cutler (Dexter Jackson won). The following January, in another workout we watched ("Killing It," June 2009), the student matched his previous mentor nearly set for set. The onstage rivalry truly materialized when Heath was second to Cutler at the 2009 Olympia. Those places reversed at last year's Olympia and the Sheru Classic that followed. Will Mr. O No. 11 and Mr. O No. 13 provide another thrilling one-two finish at this year's O? The battle between upstart Mike Mentzer and iconic Arnold Schwarzenegger lasted only one contest, the 1980 Mr. Olympia, and Mentzer landed four places behind Schwarzenegger, who had returned to win his seventh and final O title. What elevates their single clash is the fact that it nearly came to blows. In 1979, Mentzer, a 27-year-old rookie pro, won the heavyweight division of the Mr. Olympia (Frank Zane took the overall). He was a juggernaut, but more importantly he began propagating his high-intensity training philosophy, "Heavy Duty." He often contrasted his low-volume workouts with the double-split marathons of Schwarzenegger, who had retired from the stage in 1975. The Austrian Oak took note, and in the greatest surprise in bodybuilding history, he jumped into the 1980 Olympia, billed as a rematch between Mentzer and Zane. Backstage before the contest, the icon and the upstart got into a verbal duel that nearly resulted in punches. Onstage, the icon was again victorious. It was the final contest for both Arnold Schwarzenegger and the late Mike Mentzer, but its result and the contrasting training philosophies of its key combatants are still debated today. Eleven to one—that was the dominating record of Flex Wheeler over Ronnie Coleman before the 1998 Mr. Olympia. It dated back to the 1991 NPC USA Championships (Wheeler was the second-place heavyweight; Coleman was 14th), and it continued in the IFBB Pro League, over and over and over again all the way up to and including Wheeler's win at the 1997 Arnold Classic. A rivalry started to form in 1996 when Coleman finally beat Wheeler at the Canada Cup, but their one-two finish that day was followed by one-two finishes with Wheeler on top the following two Saturdays. And it seemed everything was in its natural order again. After Dorian Yates' retirement, Flex Wheeler was the odds-on favorite to win the '98 Olympia. That's when Coleman turned the tables on the man who had beaten him 11 times, taking the Sandow and relegating Wheeler to second. Coleman stayed on top for eight consecutive Olympias. Wheeler was runner-up to Coleman three times in 1999, including the Olympia, and third to him at the 2000 Olympia. After losing to Wheeler 11 out of 12 times over the first seven years, during the final five years, the man who went on to win eight Sandows never lost to him again. Call it apple versus orange. Frank Zane, a professorial American, represented the slighter but aesthetic ideal, while Franco Columbu, an earthy Sardinian, was his stocky counterpart. Their duels date back to the 1969 Mr. World, when 5'9" Zane won the medium class and overall while 5'5" Columbu was second in the short class, and those placings were repeated in the next year's Mr. Universe. In 1972, they filled out the bottom slots of this legendary five-man lineup with Zane ahead of Columbu again. Then in their final three contests, Columbu reversed the tables in the new Mr. Olympia lightweight class, which he won in 1974, 1975, and 1976, beating Zane each time. In 1976, the closely matched competitors finished one-two among five "lights" with Columbu going on to take the Olympia overall. They somehow avoided ever facing each other again, even as Zane won the next three Olympias and Columbu returned in 1981 to (controversially) earn his second Sandow. Still, their feud has simmered and sometimes boiled ever since. In recent years, Zane denigrated Columbu's physique, while Columbu boasted that he beat Zane "10 or 20 times." Check the scoreboard, Franco. Fittingly, this one is forever locked up at three-three. They were born just 38 days apart in 1965 and destined to be two of bodybuilding's best. The rivalry between Kevin Levrone and Flex Wheeler spanned 12 years and 15 contests. Fittingly, it was launched in the heavyweight class of the 1991 NPC Nationals. Levrone won the class (and overall), Wheeler was second. It took Wheeler another year to make it to the big league, but when he did, the rookie bested Levrone twice, including at the 1993 Olympia. In 1995 Levrone returned the favor, finishing ahead of Wheeler twice. Levrone went on to win the 1996 Arnold Classic and was third in that year's Olympia, while Wheeler was one place behind him in both. At the end of 1996, Levrone held a 5-2 lead in head-to-head meetings and had strung together four "wins" in a row. But then Wheeler flipped the script and beat his rival six consecutive times, including victories at the 1997 and 2000 Arnold Classics. But then, Levrone bested his chief rival in their final two meetings, the 2000 and 2002 Olympias. He was runner-up in both Mr. Os, giving him four Mr. O seconds (one more than Wheeler). Either Levrone or Wheeler is the best bodybuilder to never win a Sandow, and each was the other's greatest competition. The clash between Rich Gaspari and Lee Labrada was the '80s version of Levrone vs. Wheeler, with both shorter men battling to be the world's second-best bodybuilder after the taller Lee Haney. The younger, 5'7" Gaspari made it to the IFBB Pro League one year before 5'6" Labrada, but both traveled the same path, winning their class at the NPC Nationals and the IFBB World Championships in back-to-back years. 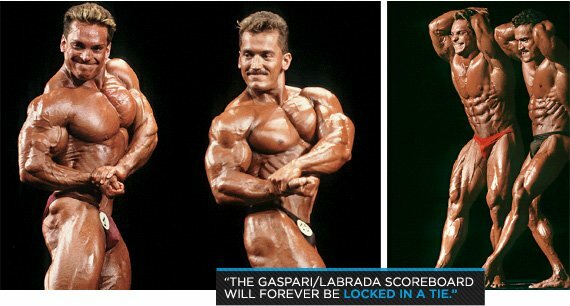 They stayed clear of each other in 1986, but in '87 Gaspari bested Labrada three times (twice by one place) before their epic confrontations throughout Europe the next year. Incredibly, in seven European Grand Prix shows in 1988, they finished one-two in six of them and one-three in the other. Gaspari won four, Labrada three. Over 1987 and 1988, they were separated by one place eight times. In 1989, Labrada succeeded his greatest rival as runner-up at the Olympia and repeated that second again in 1990, besting Gaspari both times. Gaspari had more Olympia runner-up finishes (three to two) and pro wins (nine to seven), but he also competed more, and Labrada was more consistent (his lowest pro placing was fifth). Who had the better career? Appropriately, the Gaspari/Labrada scoreboard will forever be locked in a tie. Those one-two Gaspari/Labrada finishes were among the most evenly matched clashes of all-time, but they lacked the high drama of the Olympia crown up for grabs. For that, we look to the eight O battles between Jay Cutler and Ronnie Coleman from 1999 and 2006. Over that span, the pair finished one-two an incredible 11 consecutive times, including at four Olympias. The first of those two are a pair of nearly forgotten Euro Tour shows after the 2000 Olympia. 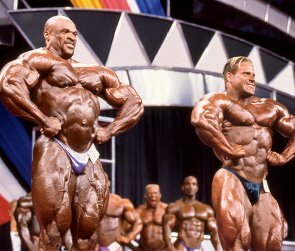 Then, at the 2001 Mr. O, Cutler pushed a smaller-than-typical Coleman to the brink and had a commanding lead after prejudging before falling just short. It leads us to wonder what their scoreboard tally and Sandow collections would look like had Cutler both denied Coleman his fourth such trophy and snagged his first on that fateful day in 2001. As it was, the perpetual bridesmaid to wait his turn for another five frustrating years. But in 2006, Cutler finally caught Coleman, taking the Olympia crown from him and adding three additional one-two wins on the Euro Tour. With eight, Coleman has twice as many Sandows as Cutler, and he has twice as many wins on our scoreboard, but Cutler has a plum consolation prize: 10 top-two Olympia finishes, one more than his chief rival. That record, which includes six top-two finishes against Coleman, is a testament to the crushing defeats and ecstatic victories of bodybuilding's second-greatest rivalry. The 1972 Mr. Olympia—the fourth and final clash between Sergio Oliva and Arnold Schwarzenegger—was the ultimate mano a mano battle. 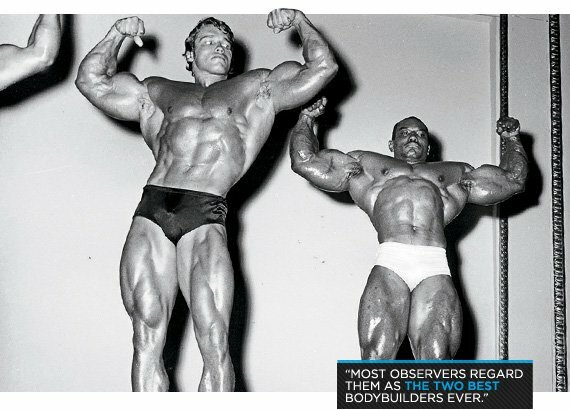 The two legends had won the previous five Olympias, and most observers regarded them then as the two best bodybuilders ever. It was a contrast in styles between the sometimes tempestuous black Cuban immigrant and the usually charming white Austrian immigrant. Mostly, though, it was about the muscle—and lots of it. They first clashed at the 1969 Mr. Olympia, literally a two-man show. The Austrian Oak was 22 and the most talked about bodybuilder in the world, and the Myth was 28 and already a two-time Olympia winner. Oliva won his third O title that day, but it was clear each man had met his match. The following year, Schwarzenegger defeated the less-polished Oliva at both the Mr. World (where Schwarzenegger was a surprise entrant) and, two weeks later, the Mr. Olympia. 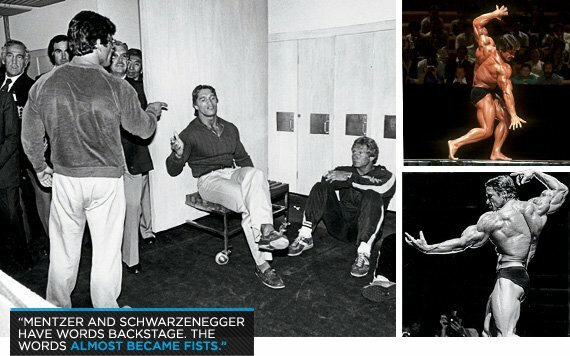 At the latter, the legend is that Schwarzenegger tricked Oliva into leaving the stage by indicating they both would go together, but then he stayed, posing while it appeared his rival fled. With each mass monster having defeated the other in one Olympia, and after Oliva had to sit out the '71 Mr. O (which Schwarzenegger won), the '72 Olympia was to be the deciding arbiter of who was the best bodybuilder of the era. Both men were at their peak. Oliva appeared fuller, but Schwarzenegger got the nod again. The result continues to be debated. In 1973, the Myth tried to get the Oak onstage at a contest, and both men appeared on a national TV talk show wherein Oliva claimed his title was "stolen," and he challenged Schwarzenegger again. As the future Conan, Terminator, and California governor went on to rack up seven Olympia titles, Oliva won in non-IFBB organizations and continuously claimed his superiority. The scoreboard and title count say one thing, but the Myth says another, and bodybuilding's greatest rivalry has persisted for 40 years—and counting.